New: Forza 7 Support. Earlier versions of 3DSimED could import Forza 7 models with the Forza Apex Import Plugin but version 3.1l has many improvements to help import Forza 7 car models. The plugin understands the new pcfamily and base sub-folders of media, has improved diffuse texture handling, includes an option to import the blur wheel materials and will read more swatchbin texture types. New: Wavefront .OBJ export plugin. New: F1-2017 _model Import Plugin . This allows individual models to be imported but requires game ERP archives to be decompressed. New: Tools ->Expand-> Single ERP Archive/Batch ERP Archive. Decompress individual or folder tree of ERP archives. Enhanced: Added rF2 shader “car body paint with damage”. Fix: Forza 7/Apex/Horizon 3 Import has better handling for missing materialbins and should not crash if files are missing. Fix: Models with deeply nested objects could crash 3DSimED. Fix: Wavefront .OBJ import could not import quoted texture map names. 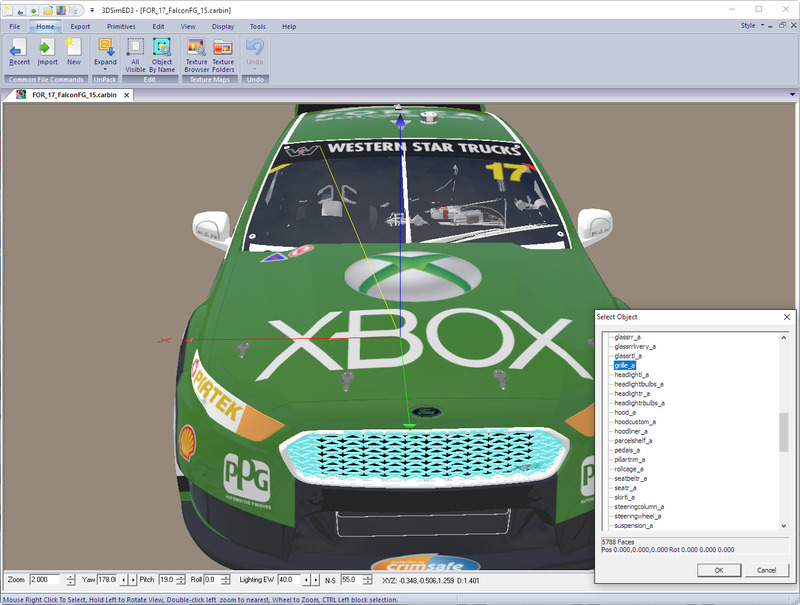 Fix: TDU Import would corrupt some meshes.